Big windows, high ceilings, exposed cement, rustic wooden furniture and faux-brick walls: it’s that hipster look that’s taking been over Hong Kong in the past couple of years – and The Bites & Co, from the guys who brought us Soho’s BCN BarCeloNa, wears it well. With ample seating and a well-stocked magazine rack greeting you at the entrance, it’s clear that this is the kind of place to pass the time in. When we arrive, several other patrons sit further down from us, enjoying one of the all-day breakfast sets. The menu includes a substantial number of pasta options but eventually it’s the interesting potato dishes which catch our eye. 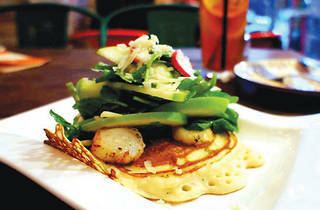 Listed as a salad, the potato hot cake with scallops and granny smith apple ($85) sounds decidedly unusual but, as we soon learn, makes perfect sense on the plate. 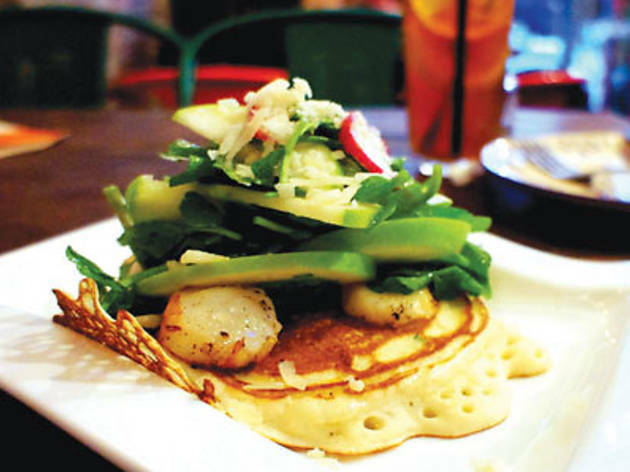 After a brief wait, it arrives as quite the looker: a golden-brown pancake topped with a burst of fresh watercress, sliced apple, radish and grated Parmesan cheese. Underneath, tender scallops lay nestled in the greenery, while lemon vinegar gently cuts the sweetness of the other ingredients in a satisfying and blissful melange. dish is ideal for sharing, we are perfectly fine with devouring it all by ourselves. The Bites & Co 42 Tin Kwong Rd, Ho Man Tin; 2264 5668; tastybites.com.hk. Tue-Fri 11.30am-10pm, Sat & Sun 11am-10pm. Meal for two: around $200.